The birds fly south in the fall, so they must fly north in the spring, right? Yes! However, they are not found at Hawk Ridge in the spring because of its location on the NORTH side of Lake Superior. Instead, the SPRING COUNT takes place further to the southwest, although still in Duluth. Here’s the skinny on the spring migration: The count starts toward March and continues DAILY through the end of May. Timing of species, as you can imagine, is the reverse of what it is in the fall. The first arrivals in the spring are the EAGLES, both bald & golden, and ROUGH-LEGGED HAWKS. Not long after that the RED-TAILED HAWKS arrive. BROAD-WINGED HAWKS and SHARP-SHINNED HAWKS begin showing up in April. Raptors flying north through our area in the spring are a little more spread out…we don’t have as great of a natural funnel for northward migration as we do at Hawk Ridge for the southward migration in the fall. In the spring, smaller birds such as Sharp-shinned Hawks and American Kestrels tend to stay down along the shore, out of range of our counters. The Northern Goshawk route is a bit of a mystery for now–our highest number for goshawks in one day during the spring is four. SOUTH or SOUTHWEST winds are best for big numbers of northward migrating raptors. I am happy to report the following: these are usually days with beautiful weather! WEST winds are also good, and the counters report that there are birds “on any wind”. Birds are on a mission in the spring: Get To Nesting Territories! This means they’re not taking their time waiting for perfect migrating weather. Numbers are, however, greatly reduced in inclement weather such as fog, snow, rain, sleet, or hail. Another spring advantage? GREAT looks! The cold ground doesn’t promote the development of huge thermals, so the birds are generally much lower, riding updrafts along the ridge instead. The ground doesn’t warm up until late May, so until then the birds will be quite low. Previous counters have reported Bald Eagles within 40 feet of them, riding the updrafts along the ridges! WHERE is the spring count? Good question! The answer, my friend, is blowin’ in the wind. What ACTIVITIES are going on during the spring count? Bird Migration Count Research is the primary activity currently taking place at the spring count site with public education/interpretation as available. The counter(s) will do their best to point out “viewable” birds, but please keep in mind, we may have some very busy migration days with limited staff. We also will be holding a Spring Migration Celebration Weekend April 26-28, 2019 with more activities for the general public – click HERE for more info (link to Spring Migration page created per #1 above). If you are interested in a private program about the spring migration (school group or other group – civic, touring, etc,), please contact Margie Menzies at mmenzies@hawkridge.org or (218) 428-8722. The main overlook at Hawk Ridge where the fall migration count takes place sits on a rocky ridge one mile from Lake Superior and about 550 feet above the lake. In the lower foreground is the Lakeside neighborhood, in the mid distance is the lakeshore itself, and on the far horizon, from left to right, is Wisconsin, the City of Duluth and the St. Louis River estuary. The counting of raptors began in 1951 as a weekend count in September. It was done by volunteers for the next two decades with coverage that varied from 4 to 42 days a year. Consistent coverage of the peak migration – early September through early November – started in 1972 which was also the first year of operation of the banding station. Starting in 1991 the migration count expanded to coverage from mid-August through late November. The results of the trial count beginning in 1971 to the standardized count from 1972 to present are published by HawkCount, the database maintained by the Hawk Migration Association of North America. Summary information about the migration timing and monthly statistics are available at the Hawkwatch Site Profile for Hawk Ridge Bird Observatory on Hawk Count. The count at Hawk Ridge is one of the two or three highest on the continent north of Mexico. 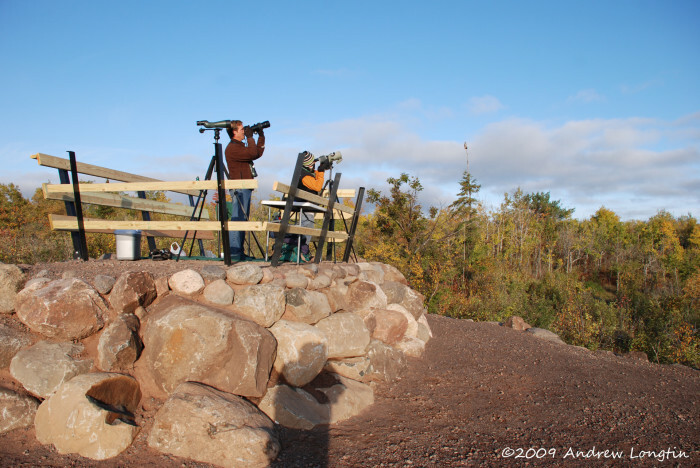 From 1991 to 2013 the average yearly number of raptors observed at Hawk Ridge is 76,000 and comprised of 16 regular hawk species and 4 rare hawk species plus 3 rare diurnal migrating owl species.